JUST 12 months after enlisting in the army, 22-year-old Lionel Veale was tapped on the shoulder by a brigadier recruiting for a new, mysterious company of men, willing to take on top-secret assignments. It was 1941, just months before Japan bombed Pearl Harbour and opened up a new, Second World War front in the Pacific. “Do you think you’d be afraid to die?” Mr Veale recalls the brigadier asking. “I said ‘I think I would, but I don’t know’. Without knowing it, Mr Veale had just volunteered for Australia’s First Independent Company – a clandestine commando unit and the forerunner of today’s special forces. For the rest of the war, he carried out top-secret missions behind enemy Japanese lines in New Guinea and the Pacific, first as a commando and then as a member of the Coastwatcher Unit tasked with bringing back vital intelligence. Mr Veale “put his hand up” for a total of six Coastwatcher missions and was dispatched from a secret base in Townsville. “We’d be sent by ambulance to an airport, and later we’d either be dropped in by Catalina flying boat or by submarine,” he said. A major role played by the Coastwatchers was to spy on Japanese units, gather information about enemy activities, scout out battlefields and report back – all vital intelligence that would help keep Australia safe from Japanese invasion. His Coastwatcher team also surveyed and mapped large, coastal reefs to enable convoys of cargo ships carrying war supplies to get through to Australian troops on the Kokoda trail and moving up the coast following the Japanese. Veale Reef near Tufi Harbour, 130km east of Kokoda, was named in his honour, and is now a popular dive spot. Mr Veale, who turns 98 in August, has known many honours during a lifetime of service. Just as he “put his hand up” for dangerous wartime assignments, Mr Veale has always volunteered to serve his community. 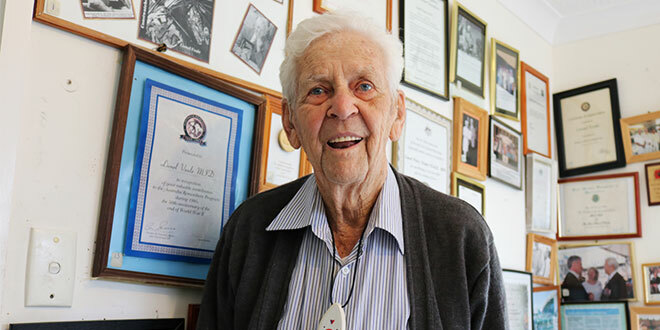 He will soon receive a Medal of the Order of Australia after being included on the Queen’s Birthday Honours List for his service to the Gold Coast community, particularly his 35 years’ work for the St Vincent de Paul Society. His Order of Australia adds to a long list of awards received, including the 2011 Gold Coast City Council Community Service Award. Mr Veale was born in Armidale, and was raised a Catholic. He went to school at De La Salle College in Armidale. “I’m very happy I was born into the Catholic Church. It’s a part of my life, and I couldn’t imagine life without being a Catholic,” he said. Mr Veale grew up inspired by the First World War service of his three uncles in France on the Western Front. At school Mr Veale was a member of the senior cadets, but still remembers having other interests. “They got me in the choir. I used to sing in the cathedral when I was 16 and 17,” he said. At the end of the war, Mr Veale married his beloved wife Patricia and they moved to Southport where they set up home and raised four children. Mr Veale worked for the Post Master General for many years while developing a business selling giftware and homewares. As business flourished he left the post office. When he was not long out of the army, Mr Veale began a long and distinguished association with the St Vincent de Paul Society. He was involved in helping to form the society’s regional council on the Gold Coast, and from 1970-75 held the position of president. In the early years, Mr Veale attended meetings held in Brisbane as the Gold Coast representative, and at one meeting put a motion forward that women be given the right of membership. He knew there was resistance amongst some of the members, but he felt strongly about women being recognised for their work. His motion was seconded and passed at the meeting. In his five-year stint as president, Mr Veale helped provide for the needy in a rapidly-growing Gold Coast community. Under his presidency, Vinnies started its first store. In 1974 when floods devastated the Gold Coast, Brisbane and Ipswich, Mr Veale stepped in to help police and to organise relief efforts. Responding in an emergency was second nature for a man with Mr Veale’s military resourcefulness. “There was a lot of need at that time,” he said. Thanks to a generous donor, Mr Veale secured enough household goods to furnish 50 flats. The goods came from a building complex in Surfers Paradise that was to be demolished. Mr Veale contacted the Brisbane and Ipswich conferences of St Vincent de Paul and together with the help of TNT Transport and the state government they organised semi-trailers to transport shipments of furniture and goods to the most needy. Perhaps Mr Veale’s longest-lasting achievements as the society’s regional president was his involvement setting up the St Vincent de Paul Nursing Service, and the completion of an aged home, now rebuilt under the name Keith Turnbull Place. Outside of his Vinnies activities, Mr Veale was active in the local RSL branch in Southport and became a foundation member of the Surfers Paradise Golf Club. Through public speaking engagements at a wide variety of community organisations, Mr Veale has kept alive the legacy of his wartime exploits and the memory of comrades with whom he served. He still speaks lucidly and in great depth about his wartime experiences, even if the events still haunt him. He has admitted to waking up screaming some nights, nearly 70 years after going to war. “Of the 80 men who made up the First Independent Company, 47 were killed,” Mr Veale said. His speaking engagements helped him gather his stories together and to write four books during his retirement years. Mr Veale first wrote Wewak Mission, a gripping account of Coastwatcher missions behind enemy lines to set up an observation post to monitor the major Japanese base of Wewak on the PNG north coast. After wife Patricia suffered a stroke Mr Veale devoted his time to her needs at home and finally in a care facility until her death. It was then that Mr Veale said writing became “a welcome distraction from the strain and loneliness of the circumstances”. He wrote two more wartime accounts, Long Island and Final Missions, and a novel, And then there were two, drawing on the experiences of other Coastwatchers. Through his books, Mr Veale has given Australia a tangible history of a desperate war on Australia’s doorstep, as well as his own courage and service. Mr Veale is now partially blind and suffering from kidney cancer. He said he often talked with God as he contemplated his own mortality. “He says to me ‘Stay down there, I’m getting the garden ready for you’,” Mr Veale said. He remains an active member of the Mary Immaculate Parish at Ashmore and sings in the choir.